Thank you so much for all of your support during the launch of Art Made Easy. I was super excited to see my logo in iTunes New & Noteworthy section of the podcast page (Kids & Family) and as the TOP podcast in iTunes Education (k-12) Category. What a thrill! And it was all because you downloaded the show and subscribed in iTunes. Today may be the best show yet. 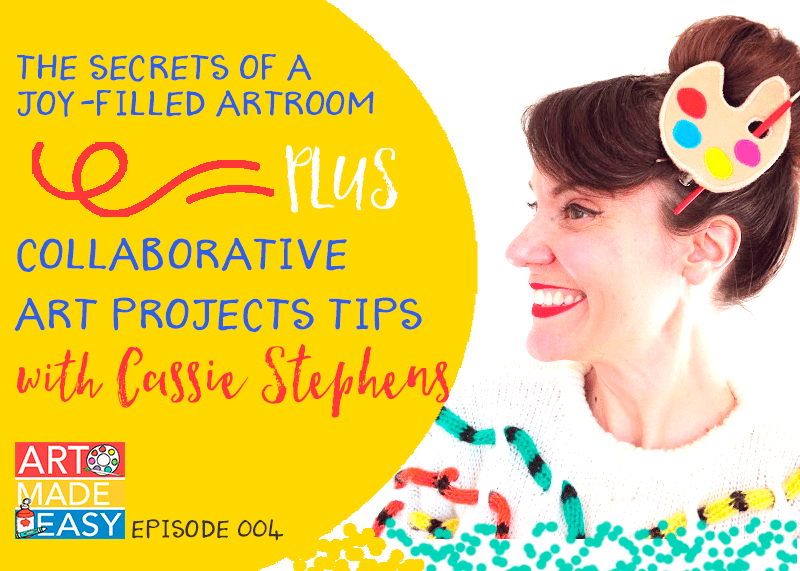 Cassie Stephens takes you inside her art room and shares her teaching strategies from how she teaches directed drawing, how she handles early finishers, and the process she uses to create collaborative murals and thematic units. If you are action oriented, grab a notepad and pencil because this show is going to offer amazing tips. 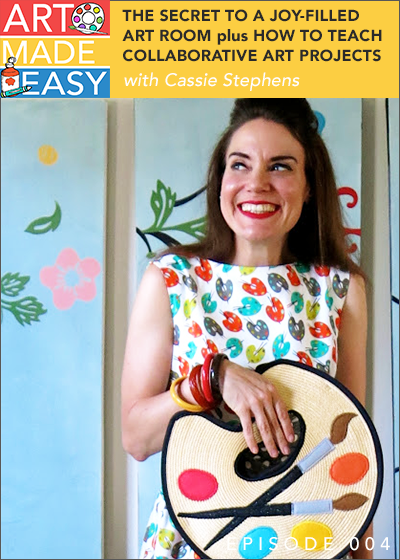 But for me, hearing how Cassie transformed herself from an overworked, stressed out art teacher (hard to believe, right?) to her carefree, colorful persona is not only remarkable but inspiring. To listen on your iPhone, download the free PODCAST AP, then subscribe to the show in iTunes. Your app will update automatically when new shows are published. If you have an android phone, you can subscribe to Stitcher Radio and download their free app. I just began listening to your podcasts, and absolutely love them! It is amazing how much our community of art educators can communicate and support one another with technology. Thanks for your dedication, hard work, and creative spirit. It is much appreciated! Hi Renee! Thank you so much. I’m so happy you are listening. Renee, was it you who changed your teaching strategy to choice base ed? That would make a great show don’t you think? Email me! This was a real treat. So many incredibly helpful tips here. Thanks Patty! This was my first podcast and I really enjoyed it. I’ll be back for more! I’m in school to become an art teacher and have already learned so much from Cassie. I’m a huge fan, so this was a real treat. Hi Patty, thanks for interviewing one of my favorite people, Cassie Stephens. I have just one small thing to point out – good interviewers talk very little, except when asking the question, and never interrupt their guest. Maybe your aim is for more of a shared conversation, and not so much an interview, in which case I take it all back! But just thought I’d share an observation. Keep up the good work! Ouch! Okay, I’ll take the point. My goal is to have a conversation but I’m new at this and I know my technique will improve. Thanks for listening! I am really enjoying your series of podcasts. They are really entertaining, informative and helpful and I am learning an awful lot of practical tips that I can adopt immediately in my art classroom. I just have more of a technical question. I was pretty much exactly in the middle of the Cassie Stephens episode, when I had to pause and attend to some other business. Long story short, I was using my son’s I-Pad Mini, he recommandeered it, during my brief absence and closed out the podcast and your website. I want to resume my place in the podcast. I can figure out how to make you and your guest talk in double time, and although kind of cute in an Alvin and the Chipmunks sort of way, is simply too slow to get me back to the spot I left off at. So …. Is there a way for me to fast forward in a more expeditious manner? I can’t for the life of me figure out how I can do this. The platform I am using currently are I-Pads, but I do have an android phone and could download the app through Stitcher if there is a faster forwarding feature there. So please help this technological dinosaur! Keep up the outstanding work. I will keep listening, even if I have to listen to you and your guest on helium! Good to hear from you. And this is a great question. When I’m listening on my computer, you can click your mouse on the player bar to fast forward. When you’r listening in iTunes, you can fast forward easily by using the fast forward button. Also, if you listen on a phone, you can use the SKIP feature and hop forward by 15 secs or by touching the play bar (it’s actually not a bar, more of a line). I would suggest listening via iTunes on your iPad. You’ll see the podcast playing in the music bar and you can manipulate it form there. Thanks so much for sharing this podcast. As a preschool art teacher, I’m always trying to find new ways to influence our children and introduce them to new artists. 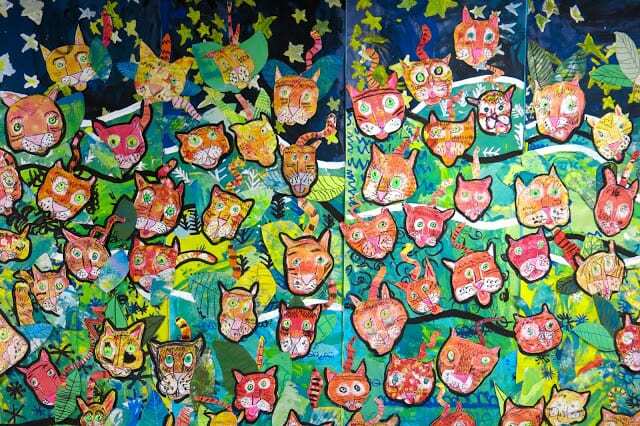 Creative Tots Preschool focuses on bringing the artist out of every young child! Thank you for inspiring me and other teachers like me! I am new to DSS and I LOVE it. I’m learning so much. The podcasts are so helpful. Thank you for being so fabulous! I am relistening to this podcast today, at a much more relaxed pace than I did originally back in 2016, and so I have perused through all of the attachments at the end of the podcast. This podcast and information is incredibly helpful, I really appreciate the work you do, and I think Cassie Stephens is amazing. Thank you for this gem of a podcast!